Users are members of your company or team who have access to your Canvasflow account. This article talks about managing User accounts in Canvasflow. 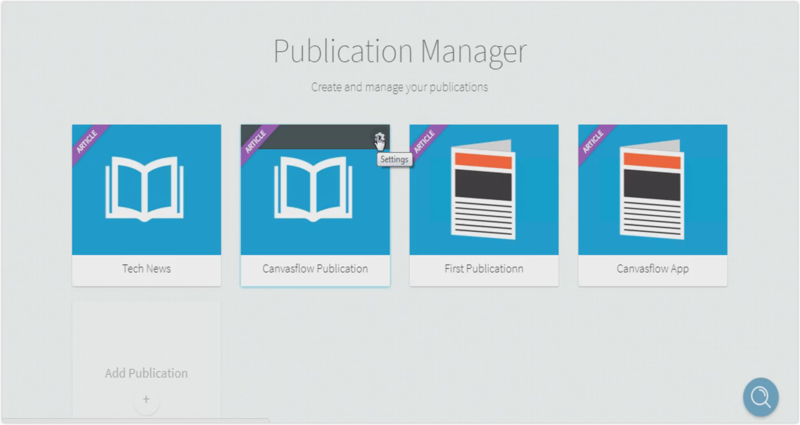 In Canvasfow, users are managed on a per publication basis and provide the ability for multiple people to work on a publication simultaneously. From the Publication Manager, select the 'more' option represented as a cog icon on your chosen publication. (Publication settings menu can also be accessed via the 'Settings' button from the admin toolbar once inside a publication. 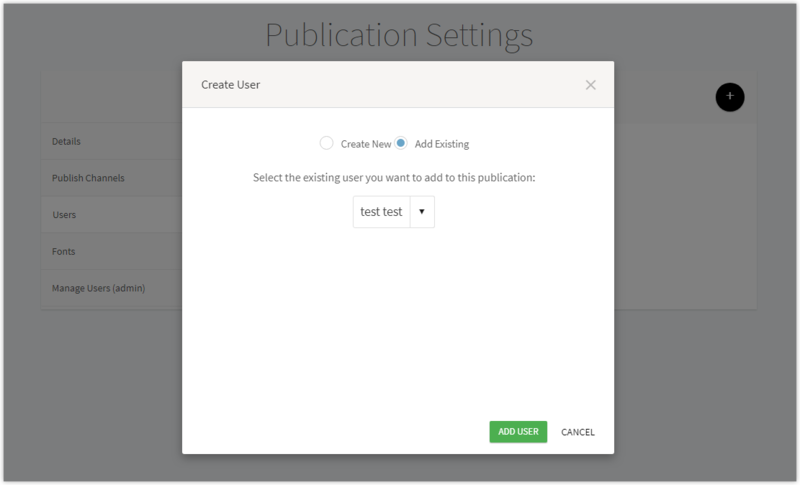 The Publication Settings page will be displayed, select the 'Users' tab. Create a new user by clicking the + icon. Fill out the user information - Name, Email Address, Password and Role (more information on user roles). Click 'Create', the User has now been created and is able to log in. 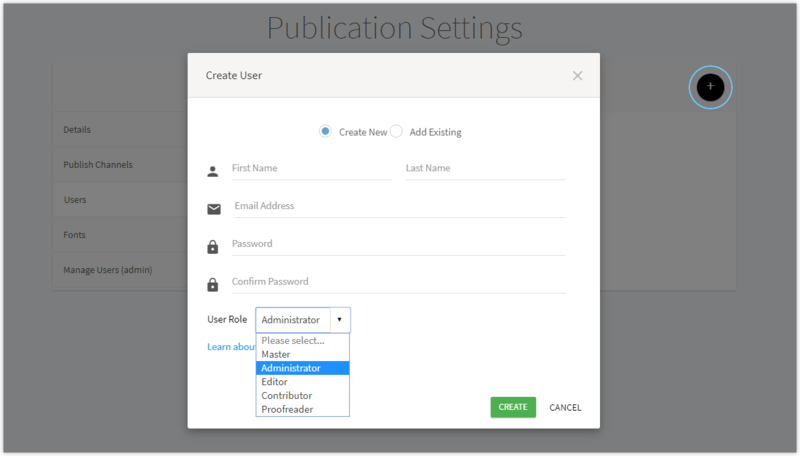 Existing account users can be assigned to multiple publications, eliminating the need to create multiple user accounts per publication. Select 'Create User' represented by the + icon. From the tab select 'Add Existing'. Select the User you would like to add from the drop down menu. The User will have access to the new publication from next login. 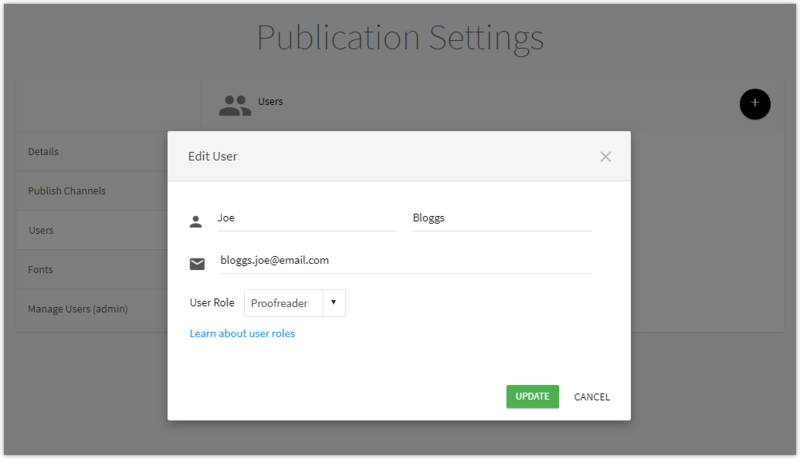 If a user is assigned to multiple publications, they will have the same user privileges across all publications. It is not currently possible for the same user to have different privileges dependent on the publication being accessed. If you need to revoke access for a user for one or more publications, you can do this by simply removing a user. Users can be removed from one or more publication at anytime. Access the setting of the publication you want to remove the user from. From the Users tab, find the User you want to remove and click the 'more' icon. Select 'Remove User' from the drop down menu. Removing a user does not delete the user, it simply removes access to the specific publication. A user that has been removed from all publications in an account is still able to login. A user cannot be deleted via the users tab. To delete a user, use the 'Manage Users' tab, which is accessible only to users assigned the 'Master' role.